Background Eraser is an application for removing watermarks, a background of an image and beautifying the pic in the whole. So you can edit photos with high accuracy. To use the application is not at all difficult. Just select the picture you want to edit and use all available tools to work. It will take a little time. When you finish editing the image, it will be saved by default in PNG format without background. You can also save it in JPG format on a white background if you want to save some space in the device memory. The resulting images can be shared in WeChat, Instagram, Facebook. Background Eraser – quite useful photo editing application, which allows you to easily remove background and watermarks. 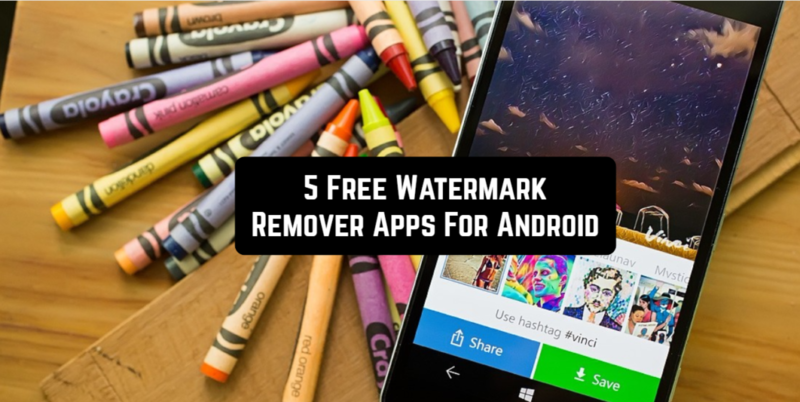 Remove Logo From Video – Remove Watermark is a smart video editing tool that will help you to delete watermark on any video. It works with all video formats. Everything is simple. Select and load the video, drag and scale the remover area to remove the watermark. Set time period. Then, press done and preview the changes. It is possible to share the video with others on social networks. Remove Logo From Video is a simple tool that can remove logos on the video. In other words, if you have recorded something from the TV, you can delete the channel logo or watermark of the author. Remove & Add LOGO is the program for removing watermarks, logos and other inscriptions from images and video. The utility is simple and understandable to each user. Select an image or video from your gallery and load it. Then, choose the option to remove the logo. After selection, specify the area of logo and duration. You can also use a zoom option to better select small areas. After you’ve made all changes, save the image or video and view it or share with others. Watermarks and unnecessary logos, removed from the image or video, will be almost invisible in the future. As the advantages of the program, you can highlight the simplicity of the interface, the speed of work, the ability to impose a watermark, and not just delete it. The Photo Healer application intended to clean up pics from unwanted objects can be also used as a watermark remover. It allows you to hide the logo or watermark so that the image looks like the original. It is simple in use and effective. First, you will be asked to select an image you want to edit. Then, you need to highlight the area you want to remove. Click the Heal button. You can repeat this action several times to gain the best result. After all changes done, save the edited image and share it with others. Remove Logo From Video is a simple service to remove watermarks and logos from videos. Just choose the video from your phone’s gallery, choose the area and scale rectangle. Then, click on Create to remove. The program is easy to use, works with most popular video formats. Remove Logo From Video is a very useful tool that can remove any logo or watermark, regardless of whether it was inserted manually or automatically.